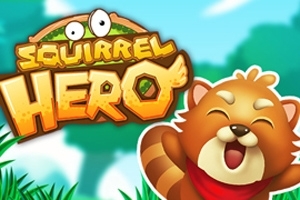 Help the cute Squirrel Hero to defend their tree against strange alien creatures that come floating through the air and attack the squirrels home. The bravest of the squirrels fight the aliens be jumping at their heads from above and prevent them from passing the tree house. In 25 exciting levels you fight a rearguard battle as more and more creatures attack and the squirrels have to climb higher and higher into the treetops. The higher you get, the cooler extras you will find and the more power-ups you are able to afford. Freeze your enemies, slow them down or even throw bombs at them.